How many of us still remember the familiar folksong, Fifteen miles on the Erie Canal—the catchy tune conjuring images of trusty mules, low bridges, friendly folks, and long journeys. What you may not realize is that although Sal the mule retired long ago, America’s most famous manmade waterway continues to offer a unique way to explore the Empire State. More than 500 miles of navigable waterway and 230 communities stretching across the full expanse of upstate New York are here to explore. 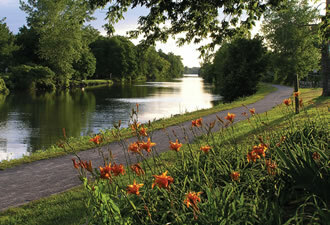 You can ride your bicycle from Albany to Buffalo on the Erie Canalway Trail, rent a canal boat for a few hours or a weeklong vacation, or hop onboard one of several tour boats and leave the steering to someone else. Along the way, be prepared to experience the rich history, hometown hospitality, and numerous attractions of the Erie Canalway National Heritage Corridor. 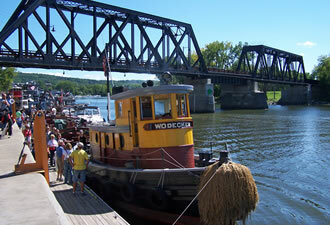 Nowhere else will you find the distinctive locks and low bridges of the New York State Canal System or discover towns and cities whose watery front doors still give way to historic Main Streets with one-of-a-kind shops and restaurants. Begin your journey in the east, west, or smack in the middle, you can’t go wrong—both water and the trail connect the canal’s treasures like gems on a necklace. Special Passport to Your National Parks ® stamps are available at 21 heritage sites, each one telling a different part of the canal story. Collecting them all promises a more complete experience and memories to last a lifetime. In western New York, for example, you can get your passport stamped at the Erie Canal Discovery Center in Lockport, visit the historic Lockport Flight of Five locks, and take a boat ride through today’s locks. Heading east, distinctive canal villages, each with its own lift bridge, beckon. These communities have been welcoming canal travelers for 185 years, so expect to find welcome centers, waterfront parks, and friendly folks as you go. On the water, you’ll see cruisers, kayaks, and crew teams, alongside the canal system’s blue and yellow work boats and other historic vessels. The men and women who maintain the canal carry on a long and proud tradition. They’ve been known to spin a yarn, as likely as teach you how to tie a bowline or show you how a lock operates. Come by boat, bicycle, or car …no matter. Whether you travel 15 miles or 500, there’s much to discover along the waterway that shaped the nation. 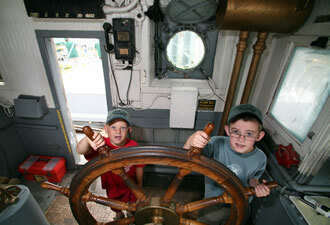 By Jean Mackay, Director of Communications and Outreach, Erie Canalway National Heritage Corridor. The National Park Service acts as partners and advisors to national heritage areas by providing technical, planning, and limited financial assistance. The decision-making authority remains in the hands of local people and organizations.